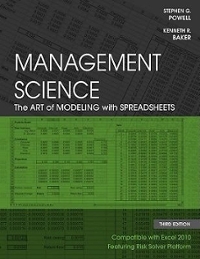 Management Science 3 Edition Now in its third edition, Management Science helps business professionals gain the essential skills needed to develop real expertise in business modeling. The biggest change in the text is the conversion of software from Crystal Ball to Risk Solver to reflect changes in the field. More coverage of management science topics has been added. Broader coverage of Excel demonstrates how to create models. Additional open-ended case studies that are less structured have also been included along with new exercises. These changes will help business professionals learn how to apply the information in the field.